This will be a monthly series in which I discuss my hair journey from now through my 5-year nappiversary in February 2013. After three weeks in flat twists with twists (see earlier post), I flat-ironed my hair for an event. It was more out of necessity than desire, but I enjoy the temporary change-up from my usual routine of twists. 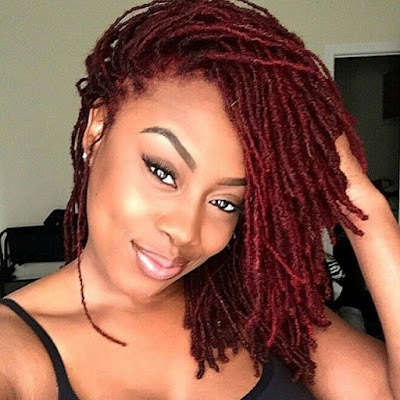 If you choose to flat iron your natural tresses, be sure you are aware of AND prepared for the possible risks (e.g., split ends, heat damage, breakage). I purposely refrained from flat ironing my hair during the early part of my natural journey because I did not want to risk a setback. Now that I am at a comfortable point in my hair care journey, I do not mind straightening my hair once in a while (~3 times a year). 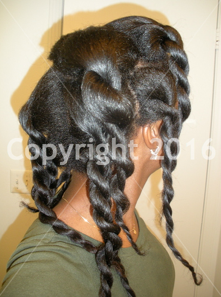 I started with freshly washed, detangled, and conditioned hair that was air dried in ~12 braids. (See this page for my wash-condition-seal regimen.) Then I undid each braid, applied Proclaim heat protectant generously, and proceeded to flat iron smaller sections with a maximum of two passes. 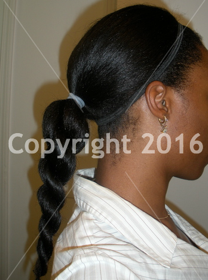 My straightened hair will be in pinned up jumbo twists for the next two weeks (if not three). Just because my hair is straight does not mean I can shy away from protective styling altogether. On the weekends, I might wear twistouts, depending on my mood. Yayy Im so happy your posting about your hair :)!! humm, I am loving the post on straigthening, Ive been natural for 3 years and I am considering flat ironing my hair maybe twice a year to help loosen my texture some to help with the detangling. I've found the longer and seemingly thicker it gets it is a very time consuming job, it takes extreme patience. And I have notice a tiny amount of breakage off of SSK too. I use to be very anti flat ironing but with this new area I find my self in, I am entertaining it more and more, but of course will proceed with the healthiest regimen using heat. I"m curious with how often one would have to straigthen to get the "loosening" effect or is it a matter of time? I really want to reduce tangles and knots. Hi Chan. It would be a combination of frequency, temperature, and time. In order to avoid severe heat damage (including breakage, splits, straight pieces), it will take a few years, moderate temperature, and flat ironing maybe a few times per year for gradual loosening. It'll vary depending on the hair.